Featuring an outdoor pool and lush green gardens, Orchard Resort operates a 24-hour front desk and offers luxurious rooms with tranquil views of the hills. Free Wi-Fi access is available in the entire property and parking is provided on site. 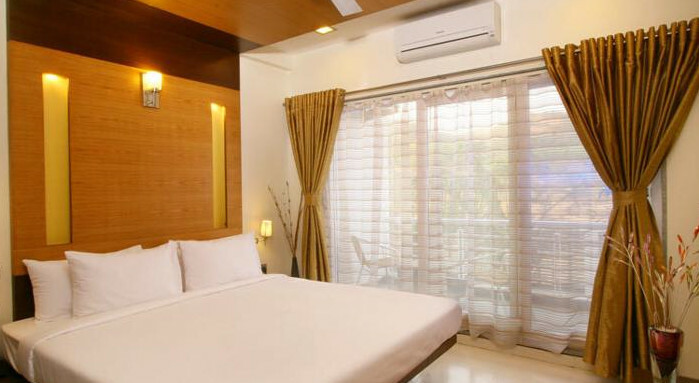 Situated close to Ryewood Park, the resort is conveniently 3 km from Lonavala Railway Station. Pune International Airport is within an hour’s drive away, while Mumbai Airport takes about a 2-hour drive. Fitted with a private balcony, modern air-conditioned rooms are furnished with a personal safe, a flat-screen satellite TV, wardrobe and seating area. En suite bathrooms are equipped with hot/cold shower facility and free toiletries. Orchard Resort offers luggage storage, laundry and ironing services. It also has a tour desk that can assist with sightseeing excursions and travel arrangements. Meeting/banqueting facilities are available on request. The in-house Tiffany’s Restaurant serves delectable Indian and international dishes, while the bar offers a range of fine spirits. Guests may also enjoy meals in the comfort of their bed with room service. Copyright © Stayingat.com. All rights reserved.